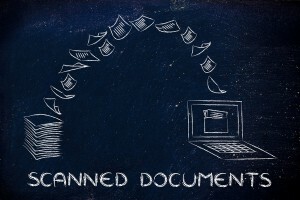 Why Do I Need Document Scanning? Many businesses that have already made the transition to a document scanning system started off asking themselves this same question. There are quite a few reasons to switch to a paperless document management system, other than wanting to do your part in helping to save the environment. With the constant advances in technology, businesses have the ability to continually change and evolve the processes that they use in a way that best suits their needs. Document scanning systems are an example of this. In the past, paper filing systems were seemingly the only option for a business to keep track of their records. Now, every business has other options to choose from when it comes to document management. If you are looking for a document management system that is faster, safer, and easy to use, then document scanning may be exactly what you need. Ease of Use- Document scanning provides you with the control to organize and manage your company’s records in your own customized way. You are able to use as many categories as you feel necessary, to decide which documents fit into each category, and to choose which associates are given permission to access each bit of information. Faster Record Retrieval- With a document scanning service, finding specific documents is a much quicker process. Rather than spending time searching through hundreds of papers, a scanning program allows you to search and pull up a file using only a keyword. Protection from Disaster– As the saying goes, “it’s better to be safe than sorry.” In the event of an unexpected disaster, document scanning provides you with protection from your records being ruined or lost. When you finally decide to take the plunge and invest in a document scanning service for your business, Record Nations is here to guide you. Give Us a Call and Get a Personalized Quote on a Document Scanning Service for Your Business Today! Whether you want your business to run more smoothly, are ensuring that your records are securely protected, need to gain better control of your document management system, or all of the above, we want to help. Fill out the form on the right, or give us a call at (866) 385-3706 to receive your free quote within minutes!